Policies: The maximum total number of guests (adults and children) in a room is four. Children under age 21 must be accompanied by an adult. Restaurants: Complimentary buffet breakfast service in the atrium. Pool: Outdoor swimming pool and jacuzzi. 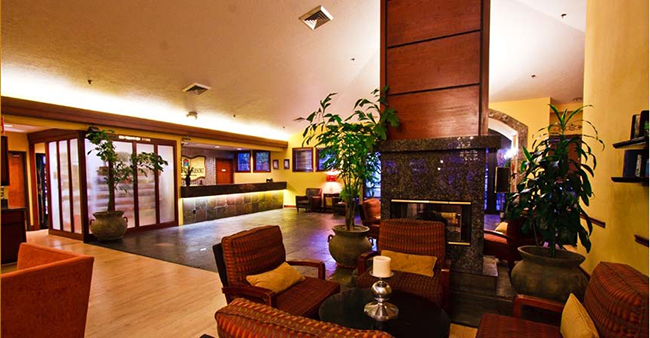 Convention rooms: Meeting / Banquet Facilities. Business center: Business Services available. 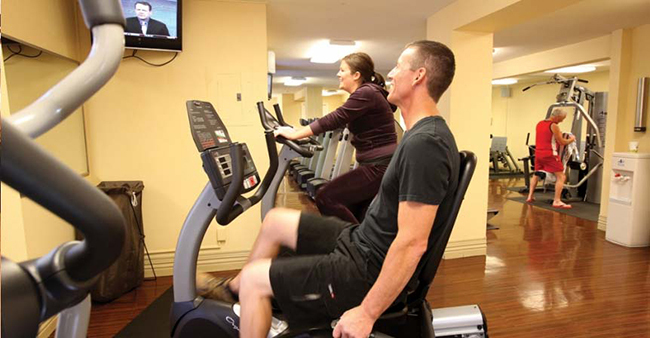 Health club: Yes, exercise room. 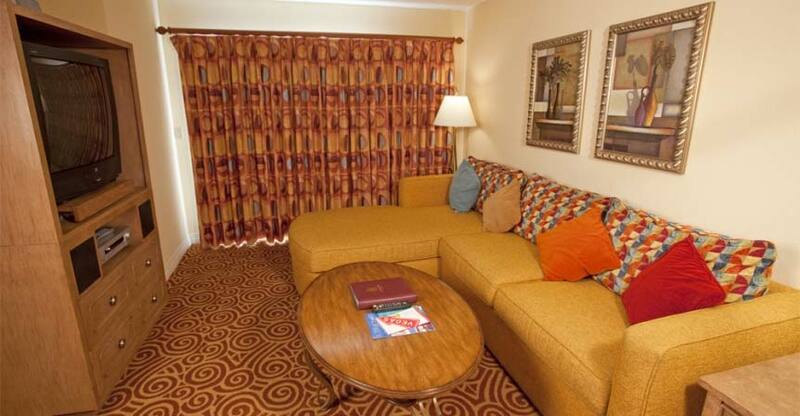 In-room internet access: Wireless Internet available. Parking garage: Free parking available. Standards room amenities: Air Conditioning, refrigerator, iron, telephone, television (Cable/Satellite), microwave oven, non-smoking rooms, daily maid service, in room broadband internet access, safe (in room), coffee maker, voicemail, kitchen/kitchenette, balcony/terrace. 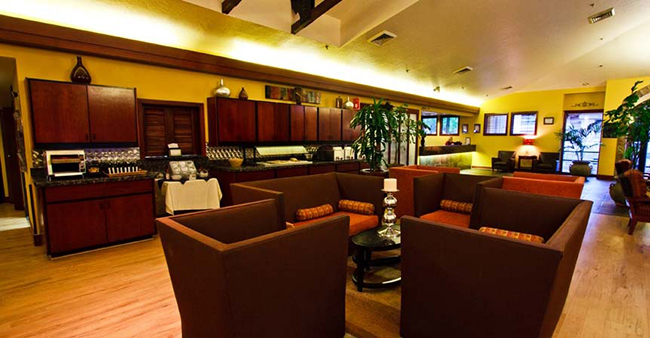 Hotel amenities: Manager's reception with wine, beer and soft drinks. Laundry room, fax (for guests), uniformed Security on site, laundry/ dry cleaning service, car rental, concierge services, complementary coffee, smoke alarm in rooms, photocopy service, ATM/bank, meeting facilities, electronic key, A-V equipment rental room service, convenience store, free parking. 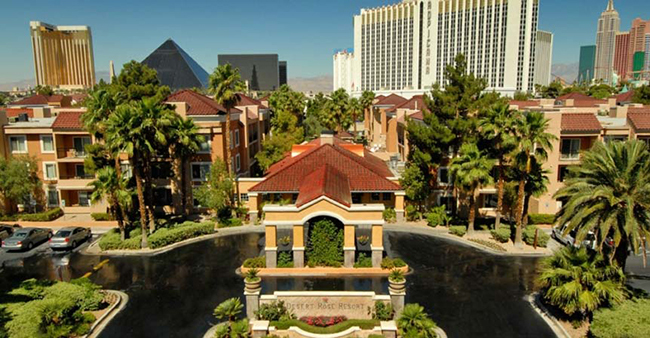 Located in the heart of the Las Vegas Strip, the Desert Rose Resort offers a quiet and relaxing atmosphere, suitable for both business travelers and families alike. With all the excitement of the Las Vegas strip at your door step. 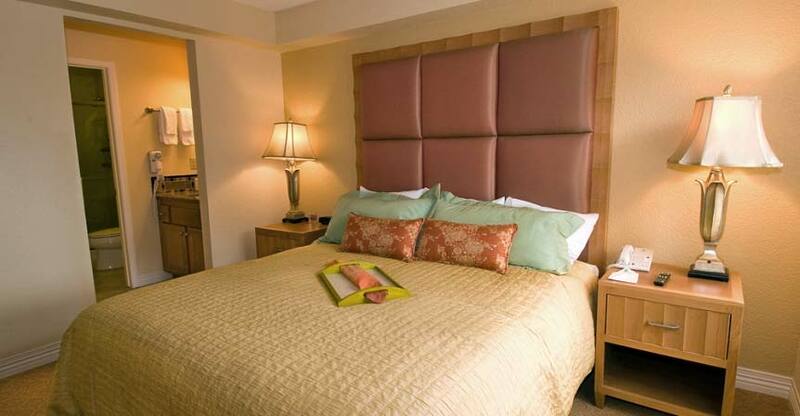 What to expect: While the accommodations at the Desert Rose are tempting, the real show is just steps away on the Strip. Las Vegas is the home to 24-hour entertainment and excitement, and you can choose your own adventure every time you head out on the town. Amenity highlights: The hotel consists of four buildings housing 284 suites and in addition to the newly refurbished pool and Jacuzzi, features lush landscaping. 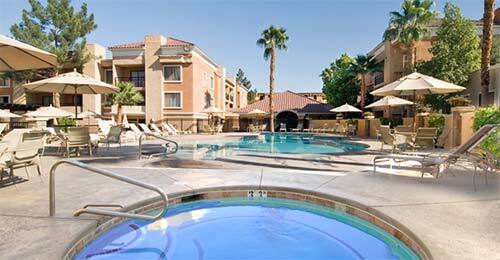 The pool area includes a kiddy pool and spa, as well as BBQ facilities and shaded seating areas. Enjoy a full hot complimentary breakfast daily in their atrium. 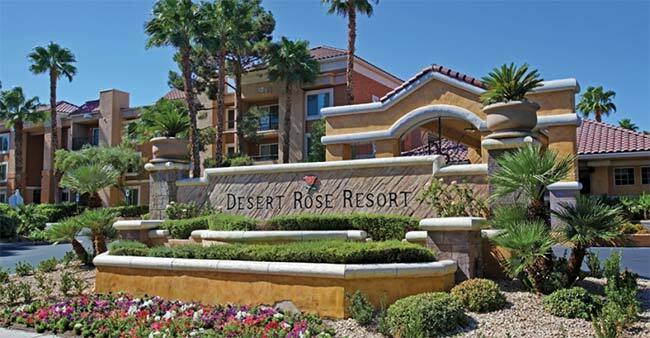 Full of amenities and perfect location, see foryourself why the Desert Rose Resort is the best spot in Vegas. Insider tip: Beyond the lights lie some of Nevada's other great attractions, and you can make day trips to drive to the Hoover Dam, ride up Red Rock Canyon, or explore the great Grand Canyon by helicopter. For those seeking the ultimate in Las Vegas fun, visit the Sandy Valley Dude Ranch, Madame Tussaud's Wax Museum and the Elvis-A-Rama Museum and Gift Shop. 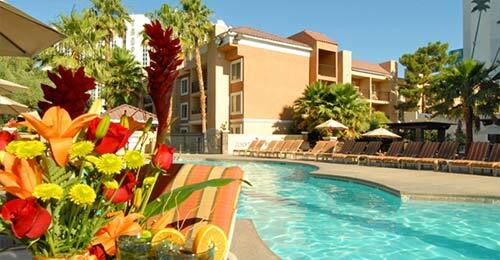 Desert Rose Resort's sparkling pool is one of its most compelling features. Located in the very center of the resort in Las Vegas and surrounded by dense tropical plants, Desert Rose Resort's pool is an oasis. A truly relaxing and refreshing hideaway – dramatically different from the crush of people at some Vegas hotels. Bahama Breeze - With its unique combination of Caribbean-inspired food, handcrafted tropical drinks, vibrant atmosphere and people happy to be of service, Bahama Breeze is the restaurant that brings you the feeling of a Caribbean Escape. GameWorks - GameWorks is your place to play! With an incredible selection of interactive games and attractions, plus great food and drinks, GameWorks is the perfect place for sharing fun times with friends and family. Cheesecake Factory - The Cheesecake Factory is a unique, upscale casual dining restaurant offering over 200 menu selections including Appetizers, Specialty Salads, Pastas, and Pizzas, as well as great Steaks and Chops, Fresh Fish, Sandwiches and 50 delicious cheesecakes and desserts. Benihana - At Benihana the food is not only cooked, it's choreographed. Chefs will have you craving for more as they slice and dice your meal before your eyes. Highly skilled and trained in the art of "eater-tainment" your personal chef will perform as they cook such favorites as steak, chicken, seafood and fresh vegetables in traditional Japanese style on a hibachi table. Diego's Mexican Cuisine at the MGM Grand - Traditional recipes hand-picked from the Mexican countryside create the foundation for Diego's bold menu. Then he makes them completely his own. Using honest ingredients and modern techniques, he enlivens authentic Mexican dishes with new twists to create new favorites like carne asada or cochinita pibil. You'll find the bright and vibrant restaurant just as exciting as the food. Pampas Brazilian Grill -Meat, on a sword, at your table...Pampas Brazilian Grille inside the Miracle Mile Shops at Planet Hollywood is not your average restaurant in a mall. Pampas serves up something different, not just in the food, but in how they serve it. Fresh grilled meats are served on a long skewer and brought to your table to be carved tableside. There are 11 different meats making their way around the room, usually three or four at a time. Their menu includes items ranging from grilled items: frango (chicken), lombo (pork lion), cordiero (lamb), linguica (Brazillian sausage) to their accompanying sides which include: Brazillian rice, feijoda (black bean stew), fried banana, Brazillian cheese bread or Brazillian dumplings. You can also order up from a wide selection of chilled foods: sun dried tomatoes, imported cheeses, proscuitto, smoked salmon, and a variety of salads. Nine Fine Irishmen at New York-New York - Live free. Dine Well. Drink good beer. Inspired by a group of extraordinary Irishmen who led lives of great adventure, this is a pub of epic proportions starring a grand Victorian-style bar, ornate cottage areas, shop-style snugs, and two levels of outdoor patio dining with a spectacular Las Vegas Strip view. Bar at Times Square™ at New York-New York - It's like the ultimate neighborhood pub, complete with the No. 1-rated dueling piano show in Las Vegas! 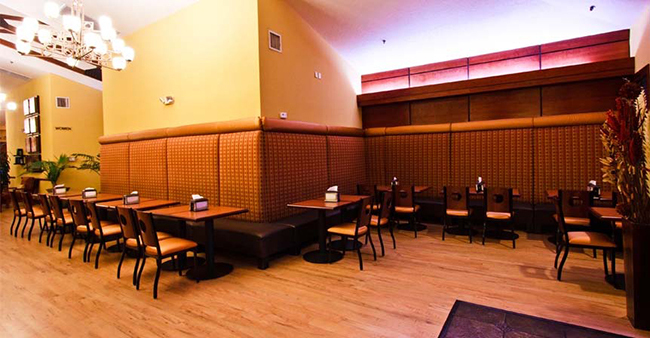 Feel free to sing along and lose yourself in the jammin' action at The Bar at Times Square™-a cozy big-city hangout. Hakkasan Las Vegas Restaurant and Nightclub - An exhilarating new concept in dining and entertainment. This unique fusion of incredible cuisine and must-see nightlife spans over 80,000-square-feet across five levels. You can find other Hakkasan experiences in London, Mumbai, Abu Dhabi, Dubai, Miami and New York City, but this is undeniably the only restaurant and nightclub of its kind on the Las Vegas Strip. Shibuya at the MGM Grand - The ultimate for Japanese cuisine and often frequented by celebrities, this stylish and beautifully appointed restaurant presents gourmet Asian fare including sushi, Toro Tartar, Miso Wild Salmon, Kampchi with fresh Yuzu and Black Truffle Oil. (Across Tropicana, an easy walk from the resort). Emeril’s New Orleans Fish House at MGM Grand - Seafood combined with the creative imagination of New Orleans’ culinary star, Chef Emeril Lagasse. Unpretentious atmosphere with impeccable service. Reservations highly recommended. (Across Tropicana, an easy walk from the resort.) 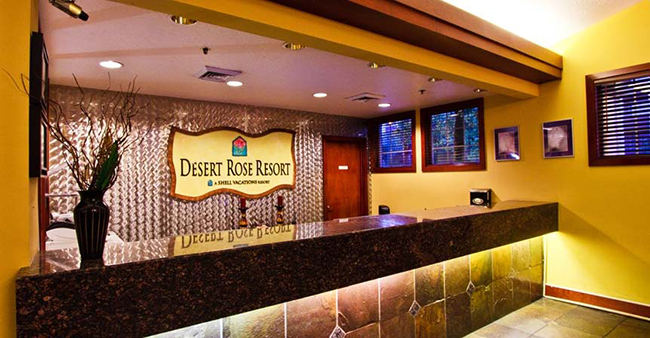 Desert Rose Resort’s on-site concierge is happy to assist you. Bobby Flay's Mesa Grill at Caesar's Palace - Bobby Flay brings his passion for bold and innovative Southwestern fare straight to the heart of the region that inspired it at Mesa Grill, Caesars Palace, Las Vegas. 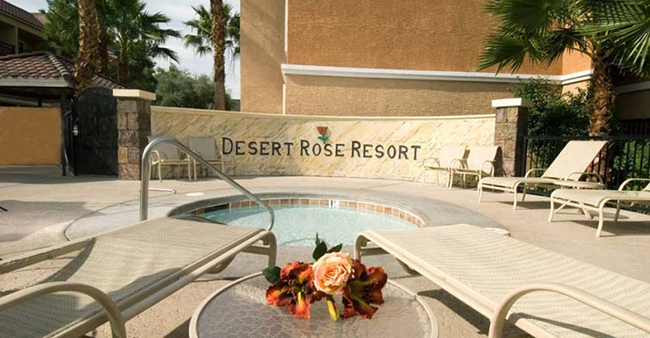 The Desert Rose Resort offers spacious 1- and 2-bedroom suites, each with comfortable living and dining rooms and upgraded baths and kitchens that feature all new appliances (dishwasher, disposal, microwave) and exquisite new granite counters. 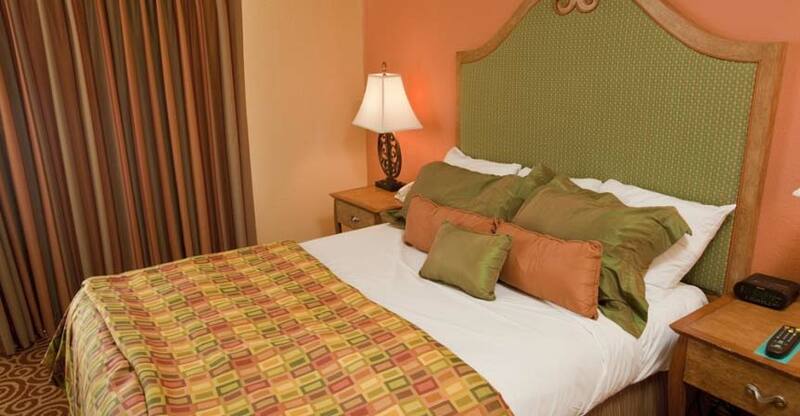 Enjoy a spacious one bedroom suite with one king bed or a two bedroom suite with a queen bed in each room. 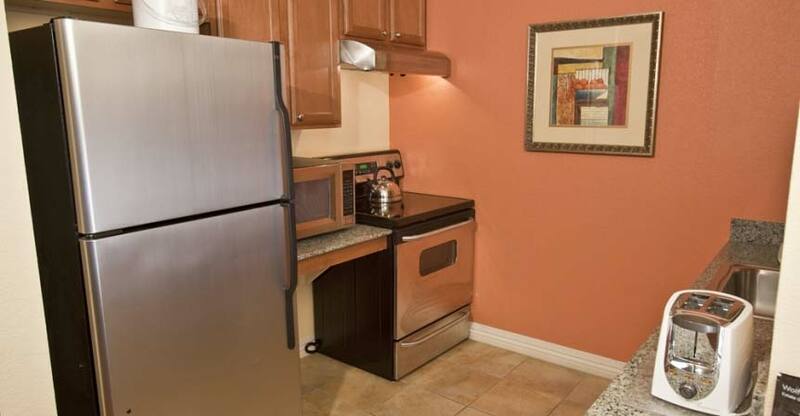 Each suite comes with a fully equipped kitchen with refrigerator, stove, microwave, coffee maker and blender. There is also a sleeper sofa with queen bed in the living room.